Here's Some Major Wedding Planning & Decor Inspo From A Bride Who Planned Her Own Wedding! Wedding planning is an extensive task where number of things are need to be taken into consideration. What happens when a renowned wedding planner gets married? After planning more than 100 weddings, Aashna Singh, the founder of Aash Studio got married to her sweetheart, Sheekhar at Grand Hyatt,Goa! After planning for nearly 8 months they executed and delivered one of the best weddings we have ever seen! Along with her husband and her team, Aashna planned her entire wedding which turned out to be a spectacular affair! From the decor to the outfits everything was more than perfect! She chose Delhi has her shopping destination and got her jewellery from Mumbai’s local stores. Aashna and Sheekhar wanted every little thing to be personalised and unique in their own. Attention was paid to the smallest of things, leaving no stone unturned to turn it into a successful event. In every function you’ll see a hint of Aashna and Sheekhar making you marvel at the decor! Guess her motto was ‘keep it simple, silly!” The couple chose not to follow any trend but to incorporate their own vision to make it unique and to match it with their identity. They did not falter in their decision due to which we now have a beautiful wedding to look up to! Straight from the horse’s mouth, Aashna’s number one tip is to stay calm, focus and to enjoy every moment of the planning process. Don’t panic, it’ll work out well in the end! A little birdie named The Photo Diary has dropped in some pictures of the wedding for you. Scroll down and get inspired! Their mehendi was a small outdoor function with close family and friends. The decor was colourful and full of candles and colossal flowers in pink and purple. They even had a quirky mini bar (Goa afterall!) Aashna was seen wearing a very pretty outfit by Seema Singh. Held in Grand Hyatt’s ballroom, the sangeet was full of 200 shiny disco balls and lots of dance performances! Aashna came across a disco ball and just imagined how 200 of them would look. Lo and behold, it looked too glam to give a damn! The ‘kissing booth’ was an instant hit which eventually turned into a photo booth! 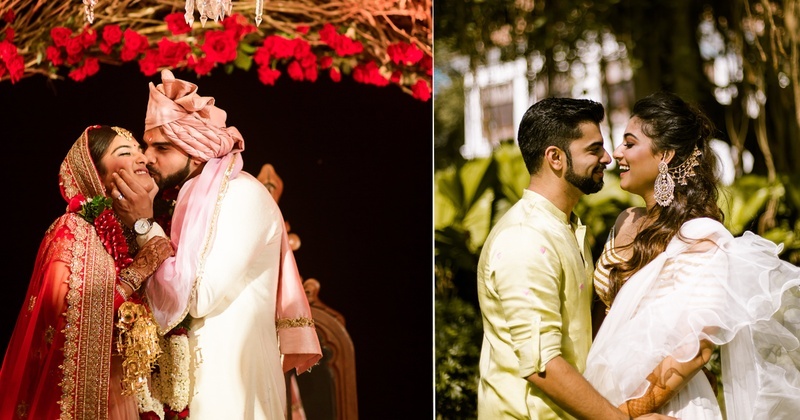 Aashna wore an elegant Shantanu and Nikhil lehenga. Traditionally haldi is held separately for the bride and the groom, Aashna and Sheekhar held theirs together. This too was an outdoor event. The wedding decor was minimalistic and eye pleasing. It was modern with a strong touch of personalization. It had a natural and moody floral accent to it. Small pops of deep colours with greenery brought a fresh, bright hue to the outdoor affair. The reception had an enchanted forest theme and the entire decor was red in colour. The red colour channelised bold vibes throughout the function! When a professional wedding planner ties the knot, you know the wedding isn’t going to be anything short of spectacular!